Without wanting to be negative about the team at Bloomsbury who worked on the book’s preparation and promotion in 2000-2001, I was always a bit disappointed that the 2001 paperback never really seemed to get off the ground after such a positive reaction to the hardback from reviewers and purchasers. This time around, in 2006, I sense that the people I’m dealing with at Bloomsbury – Holly, Will and the PR team – are genuinely interested in the book and understand what it’s about. I’m very grateful to them. A book like this will never generate a fraction of JK Rowling’s sales figures – though I’m lucky she doesn’t have a book out this year! – but it is what it is, and all one can ask is that it’s out there and available. And now, again, it is: terrific! 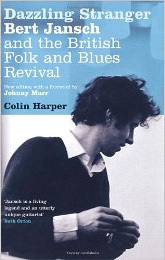 […] Colin Harper‘s book Dazzling Stranger and the exemplary CD compilation curated by Harper are the best introductions to his work and will help to ensure he is not forgotten.